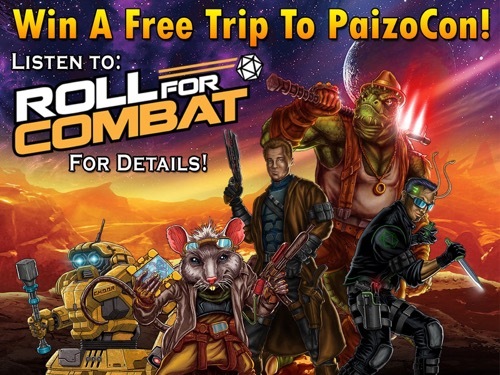 Win a Trip to PaizoCon 2019! So how does the contest work and what can you win? First, the prizes: the winner will receive a trip to PaizoCon 2019 including airfare (or a portion thereof for some international locations), a hotel room at the DoubleTree, a 4-day pass to PaizoCon, and a ticket to the PaizoCon banquet. How to Enter: Listen to the show starting with Roll for Combat Episode 70: "Never Give Up, Maybe Surrender?" and continuing until Roll for Combat Episode 76: “The Slug Defense”. Although episode 70 starts at the beginning of Dead Suns Book 4, The Ruined Clouds, GM Stephen provides a full recap of the adventure-to-date before starting a new book. It’s easy to jump right into the show without missing a beat! During each episode, you will be posed a simple question, such as “how many crits occurred during this week’s combat?” Take notes on these answers as they’ll be required for entry. Once you have all your answers, just head over to the Roll For Combat Contest Entry Form, fill out all the fields, answer one question from each episode, and you’ll be all set! The winner(s) will be randomly selected from all correct entries and be announced on April 23, 2019 on Episode 81 of the podcast. Wait, did we say winner(s)? Well, last year Roll For Combat initially was going to only send a single person to PaizoCon, but decided to extend the contest two additional weeks and ended up sending a total of three people to PaizoCon. Will they do this again this year? Who knows, but if history is any indication there is a good chance they will! What if I don’t win? Have no fear, explorer! Paizo will be livestreaming many of the seminars on the our Twitch Channel. Disclaimer: Paizo is not a partner in this contest; prize obligations remain solely with Roll For Combat. Rules and Restrictions apply. Head over to the contest page to see the fine print. Is anyone *not* going to the banquet?